Iam Back after a long Break! How are you? I miss you all and my blogging! We recently moved to a new house and I was so busy with packing and to settle in my new place.. It was so hectic and I couldn't find time to blog. Now we are settled and internet is also back. Now it's time to hop into your blogs to catch up with all those wonderful recipes have missed! Now I am back with Two yummy desserts.EGG LESS CHOCOLATE MOUSSE & STRAWBERRY CHOCOLATE MOUSSE .Delightful combination of dark chocolate and whipped cream & white chocolate, Strawberry with whipped cream. Mousse is a French word meaning "foam". 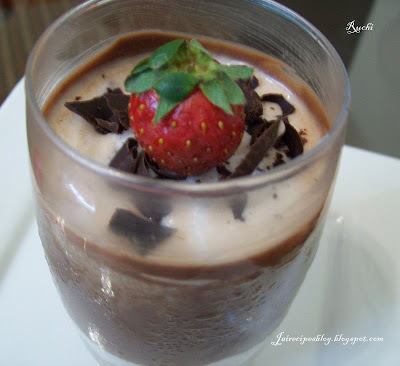 Mousse is a form of creamy dessert typically made from egg and cream in combination with other flavors such as chocolate or with pureed fruit . This method is very easy to make with no eggs added.. It has a sensuous texture, is surprisingly easy to make and delightful to share with a loved one. This is a quick dessert that can be made within 15-20 min.easy to make n serve. The beauty of this dessert is that it is made without using gelatin. 2.Stir it as it is melting. 3.Meanwhile combine sugar, with the cream and then whip the cream till it is foamy. 5.Spoon the mixture into the glasses and place the glasses Covered and refrigerate for a couple of hours. Serve with additional whipped cream, fresh strawberries and/or shaved chocolate. 3. Add sugar, lime juice and mix well; Keep aside. 4.Break thewhite chocolate into pieces and melt it, using just sufficient heat to gently melt it. 5.Meanwhile combine sugar with the cream and then whip the cream till it is foamy. 6.Fold cooled chocolate into whipped cream to blend thoroughly. .
7.Add the 5-6 tbsp white chocolate mousee then f the strawberry puree and mix well. 8. Pour into glass level top. (Points of strawberries might extend above chocolate mixture.) Cover andCool in refrigerator for around 2 hrs. Garnish with remaining strawberry pieces. Hi jaishree good to see u back. happy Vdau dear. both the mousse look awesome and you made it in such simple way that i must try them for their simplicity. thanks for sharing. What a comeback! both the mousses looks delicious and so creamy! your mousse look delicious, I simply love it, that's a fantastic dessert for your comeback!!! Wow tempting mousse, looks great! Glad to see you back!!! Hope you have settled down at your new place and its comfy too!!! Both the mousse recipes are looking very divine... Reminds me of summer, nice color!!!! 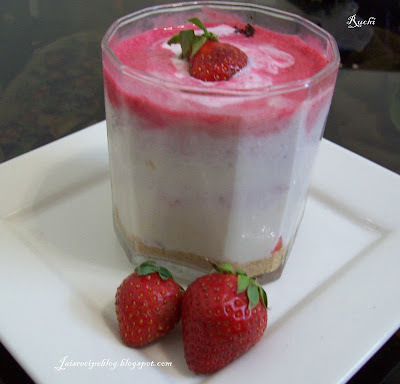 hi akka, that strawberry mousse is my choice of the two. it looks truly wow! hi! welcome back! mousse looks awesome and yummy! Both looks so good..I especially loved the chocolate. Wow the strawberry chocolate mousse looks incredible. thanks for sharing!